I read The Quantum Thief back in 2012 and absolutely loved the book. It was refreshingly clever with a lot of bold ideas driving it and a narrative that was both complex yet gripping. It presented some very forward-thinking ideas in a bold and creative way. But one thing led to another and it took a while to get around to reading the next book in the series. Enter: The Fractal Prince, the second book in the series that I finally got a copy of as a birthday gift 2 years ago. And yet still more details until I finally got to read it. No regrets wither way - it's a book worth waiting for but at the same time the complexity of these titles isn't something I'd rush into right away. This book really builds on the universe of the first book and takes it to an even crazier level. Now it's never a good idea to just dive into a complex science fiction book like this about 5 years after reading the first book but I'm pretty sure it would still be complex even 5 minutes after finishing the first book. This can be a good or a bad thing depending on your reading preferences and your exposure to harder science fiction, but the payoff can certainly be worth it. 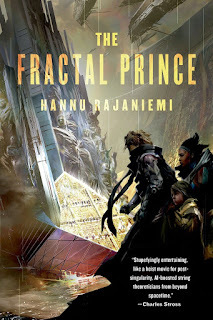 Synopsis: The Fractal Prince is the second book in the Jeal le Flabeur book series by Hannu Rajaniemi. There is a third book that follows this one - The Causal Angel. Shortly after the events of the first book, the thief Jean le Flambeur and Mieli with her sentient ship Perhonen are on their way to Earth. During this journey he continues to struggle with the Schrödinger's Box he had acquired in the last book, but his initial efforts prove to be failures. In time Mieli is one again possessed by the Pelligrini - specifically a Sobornost Founder named Joséphine Pellegrini. Jean is able to extract more information about his prior imprisonment and this inspires his approach for his next heist once they arrive on Earth. We also meet the young Tawaddud and her sister Dunyazad back on Earth. The planet is overrun with what they call wildcode - swarms of nanites running their own programs in the desert and often consuming anything they encounter. Tawaddud is a bit of a rebel in her family given her past with a jinni known as the Axolotl. She is dispatched by her father to help with an investigation in attempt to help curry favor for him and aid his political ambitions. But Tawaddud is a wild thing who knows many secrets of the desert along with the secret names used to invoke other abilities locked within the wildcode. What I Liked: Like the first book before it, this next installment of the series is daunting in its complexity but quite fulfilling to consume once you've established the feel of things. The whole world of the ravaged Earth and its jinnis and Tawaddud is a crazy one that adds even more ideas and terms to our vocabulary in order to help tell the overall story. It's not easy to figure out what is what but it remains a rewarding venture that feels like other science fiction stories of old. Rajaniemi's wordplay remains both witty yet also creative. He twists concepts from mathematics and physics and turns them into bits of technology, characters in his book, countries or races, and all that good stuff. Things are often seemingly familiar but completely alien and the book provides one with a journey of many discoveries as wrapped in a larger adventure. What Could Have Been Better: The book had me feeling pretty lost right from the get go, especially since we jumped into an entirely new culture with the alternating chapters focused on Tawaddud and her adventures on Earth. At first things feel very disjoint, which isn't too uncommon given books in the series, but they do come together in time. However getting to that point takes quite a bit of work. But then thing do come to ahead, suddenly the pace shifts and things blitz forward. Maybe we could have taken a bit more time. Maybe the progression could have been laid out more. Maybe we just need to better understand what exactly jinnis are and how wildcode is supposed to work. But the tonal shift is very tricky to balance. TL;DR: The Fractal Prince is a strong follow-up to the first book but one that is perhaps more challenging. The characters are fascinating and the setting is rich but the narrative is a little difficult to wrap your head around. Thus the book gets 4 stories presented as payment out of a possible 5.